In an earlier post titled Backing up your files – a vital step to securing your data, I outlined the basic information needed for any user to begin the process of backing up data on a regular basis. 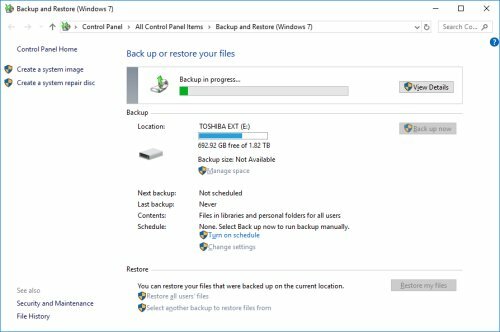 In this post, I will step you through how to perform a back up using the Backup and Restore utility which was provided in Windows 7 and above. Under the Looking for an older backup heading, click the link to Go to Backup and Restore (Windows 7). This utility will safely work if you are using Windows 8 or 10 without issue. You will now see that Windows is going to back up all users Library folders which will include the Documents, Pictures, Music, Video Libraries. Locations such as the Desktop or Favourites are all included in the Additional Locations section. Remember to also include any custom folder locations such as MYOB, WAMP, or custom locations you may have stored your email content. You will notice at the bottom of the dialog box you have the option to Include a system image of drives. 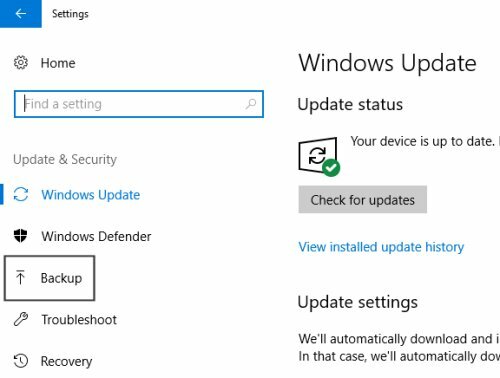 Leaving this option selected means that a copy of your system drive will be taken allowing you to restore your computer back to its current system state should any hardware fail. Without a system image, you have to manually install the operating system, all updates, and all programs you have installed plus any devices such as printers or scanners. I highly recommend you choose a schedule to run on. Select a day and time that you know you would usually have your computer on but may not be working on anything important, or set it for a specific day & time and try to ensure you always have your computer on and ready so the backup can run without interference. If you have set a schedule you do not need to make any further changes, just let the back up do it’s thing. Be sure to check in occasionally to make sure it is completing successfully. Be sure to check back with my post: Backing up your files – a vital step to securing your data to identify other methods you can use to back up your data. 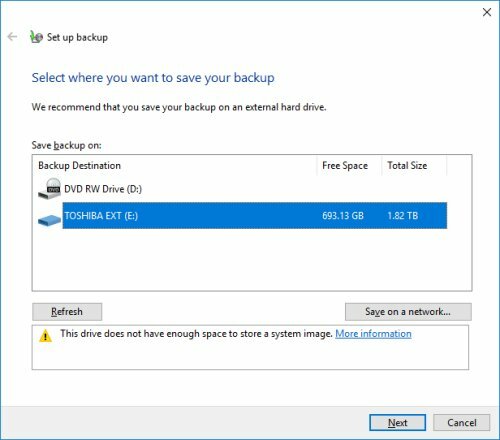 You may prefer to use the Back up using File History option available in Windows 10, or back up to a cloud-based storage solution. I’ve now published several articles where I discuss the importance of backing up the data on your computer (See Backing up your files – a vital step to securing your data); and part of that process should also include backing up email content used in Outlook. 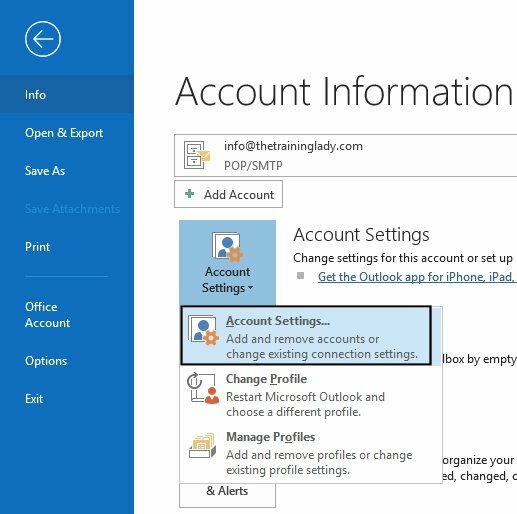 Whether you use Microsoft Outlook for personal use or access it for work, your email often contains important correspondence, photos and information that should be backed up and kept safe. I know personally if I lost my email content I would be devastated. When performing a backup on your computer you should always ensure that the Data file (or PST File as it is also referred to as) used as part of your Outlook profile is included in that process, however, if it is not or you want to back up just your email file then let’s take a look at the process. 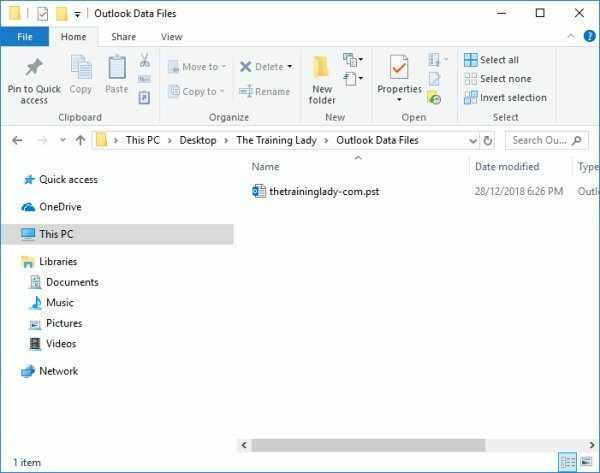 Often you will find that Outlook has created the file in an obscure location or the default location for your version of Microsoft Windows. If you cannot find a folder which is referenced in the file path, it may be a hidden system folder. 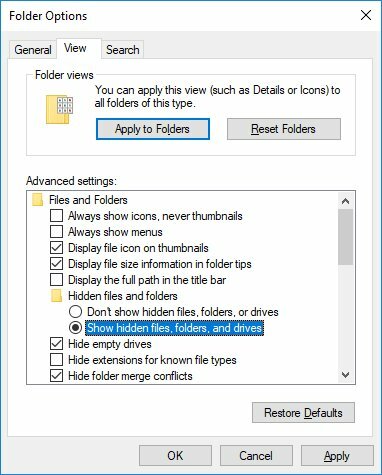 To adjust your Windows settings so that hidden files and folders are displayed, follow these steps: Open File Explorer, click the View tab and then click Options. From the Folder Options dialog box click the View tab and now make sure Show hidden files, folders, and drives is selected from the Advanced settings list. Close Outlook and manually copy the .PST file from the location specified into a folder which is already included in your regular backup schedule or directly onto an external drive or storage option – this is not ideal as it relies on you doing this manually, much better to have this process automated where possible. Backing up your PST file is easy once you are able to identify the file path and location. If you require assistance on how to backup your computer, check out my blog post. If you have any questions or require additional information do not hesitate to contact me. There is nothing worse than pressing the “on” button on your computer to find no response, no lights, and no sounds, nothing, zip, zilch… I have had this happen before, and in fact, my husband’s computer has decided to do just that yesterday. So this has inspired today’s post about the importance of backing up your files. By the way, yes I have a backup so all good here. We are living in an age where digital technology including smartphones, computers, cameras and video recorders are part of our everyday lives. More and more we are working and communicating online and therefore we have more and more important content saved on our computers. I know personally, I have over 200GB of just pictures from important events. I have my two daughters every important moment captured in photos and on video and I would be devastated for them to disappear forever, let alone the other important data I have on my computer. Our children are the most photographed of generations and for that reason, we need to ensure that these precious memories and other important data which we store on our computers are backed up adequately. There are numerous events that can put your data in jeopardy, these include hardware failure, virus infection, power surges, and even other influences including flood, fire or theft. Having worked in the IT industry for over 15 years I’ve seen my fair share of hardware failures. The impact on a business when data is lost can turn into a very expensive lesson in why backing up data is important. The impact on a home user is just as devastating with potentially years and years of information and precious memories lost. I’ve had 3 hardware failures that I can remember in the past which have required me to take measures to retrieve data and luckily I have always been able to get my files back. Many people are not so lucky when it comes to retrieving their lost files. 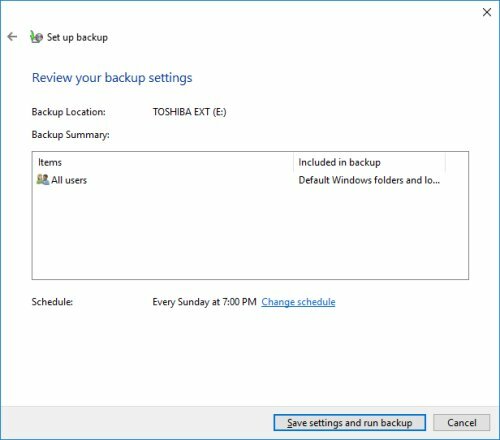 Today I’m going to show you how to use the Microsoft Windows Backup program to create a backup of your data and give you some tips for keeping it safe. It’s important to remember that there are numerous options for backing up your data, and which option you choose is dependent on your needs and other factors including how much data you have, so this is just one of the many options available. Microsoft Windows provides a built-in backup and restoration program called Backup and Restore to make it easy to create a copy of your data and restore that data back to your computer should the need arise. The Backup and Restore program can be set to either: automatically identify data to backup, or you can individually select which folders on your computer you wish to include in a backup process. An important point to remember is that it’s fantastic to say you have a “backup schedule” in place, but unless you actually allow it to run and let it finish, then it isn’t worth anything. I’ve seen many people who have a backup schedule setup and each time the backup begins to run, the user cancels it and continues on with what they were doing. Why is performing a proper backup better than just making a copy of your important files and copying them over to another destination such as USB? Technically there isn’t much difference, Windows Backup and Restore is essentially doing just that, however using a backup program has a few additional advantages over using the copy and paste method. 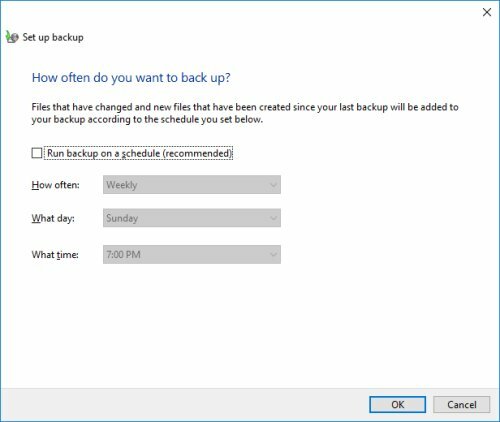 Once you have setup a Backup schedule you can just leave it to do its job, you do not need to physically perform the copy & paste manually each time, this is a big time saver. The Backup will work away in the background without any interference. Performing a copy & paste using File Explorer or even a command prompt can skip or miss important files, it will not copy any files which are open at the time you perform the copy. This means you have to close down files you are working on if you want them included in the copy process. Another major file this would affect is your computers registry file. The registry file contains all the settings for your entire computer system. The registry file is open at all times, however, is not visible unless specifically launched. You cannot copy this unless Windows Backup does it for you. Backup allows you to perform “incremental” backups. Once you have made your first backup then each subsequent backup only copies any data which has changed since the previous full backup. This means that subsequent backups should be a lot faster. Using the copy & paste method you can end up with multiple copies of the same files. This can be caused by a change in your folder structure or deletion of files and can mean your backup files are unorganised and messy, not to mention take up more space on a drive than a single backup file does. The first place to start when creating a backup schedule is to identify where you will store the backup of your files. You have created a backup and saved the backup files to your C:\Backup folder. Your computer’s hard drive fails and your computer is no longer able to start up. You, therefore, lose all your computer files including the original data files and the backup files as well. This is not a good backup solution. You have created a backup and saved all your files to an external storage drive. You have put the drive in your desk draw for safe keeping. A natural disaster strikes leaving your home waterlogged, fire damaged or worse. Your computer is destroyed along with your backup files on the USB drive sitting in your draw. This is a popular solution for many and although the chances of a disaster occurring within the home, it does still leave you open to potential risk. The best scenario is to save your backup files to an external source such as an external hard drive or cloud storage solution. If you use a hard drive then organise to have the drive left at a safe location such as your parents’ home or a good friend’s home. Depending on your type of work, you may even be able to take your backup storage device and leave this at your work premises in a secure location. I have heard of people leaving their hard drive in their car for safe keeping however you need to remember that in your car the drive will experience high temperatures during summer and can be smashed around your car while driving which could cause faults or break the drive. For security reasons always ensure the location you store your backup files is secure and will not leave your data open to theft or unauthorised access. If required you can encrypt data to safeguard against unauthorised access. A fireproof safe within the home is always an excellent option but is not always practical due to the costs involved. How many hours a day do you spend on your computer? How many day’s of work are you willing to lose if your computer crashes? Obviously, if you only spend an hour or so a day on your computer and just check emails and social media, then the need to backup on a daily basis isn’t high, once every few weeks would probably be more than sufficient. However, if you work from home, spend multiple hours a day creating content and adding files to your computer then your requirement may be to perform a backup every few days. As a general rule, a backup once a week is great for most users but this is completely up to the individual user to identify. If you have not run a full backup before then the first time you perform a backup it can take a long time to complete, and I mean hours and hours. I remember reinstalling my operating system and restoring my data back to my computer and my first backup after performing these steps took overnight to complete. The first full backup will take a while, especially if you have a lot of data. Try beginning the process as early in the day as possible and then allow it to continue overnight if necessary. If you only want to back up your own files, e.g. Documents, Pictures etc then select only the Libraries for your user account and do not worry about including a System Image. Using the information above and my tips along the way you can now begin backing up your computer system. If you have any questions or are after some specific information about how to perform a function on your computer, please do not hesitate to contact me.